However many people believe eating clean is eating boring…but just because you are eating clean, healthy food doesn’t mean your food needs to be boring or bland. Most whole fresh foods that are available are delicious on their own without any added seasoning. However, change is good and there is no need to add sugar, more sodium or any fake additives into your food choices in order to zest up the flavor you can do it naturally with an added health benefits. There are much healthier ways to add flavor to clean foods and the proper use of herbs and spices are key. Turmeric: I can’t think of a better spice to start with because this spice is actually one of the healthiest foods on the planet. The powerful phytochemical, Curcumin found in turmeric can stop cancer cells from reproducing and spreading, slow down the progression of Alzheimer’s disease and help with eight control. With its pretty yellow color, it gives food a pleasing appearance. It is inexpensive and can be used as a cheap substitute for saffron. Indian cultures use Turmeric in many dishes including egg salads, sauces, tea, fish and chicken recipes. Cumin: Another favorite in Middle Eastern recipes, this spice is rich in antioxidants that help to reduce the risk of cancer. It also has manganese and iron that work to keep your immune system strong and healthy (a strong and healthy immune system is what you are after if you want to prevent or heal from cancer). Often used in stir-fried vegetables and some Tex-Mex meals. Cinnamon: Cinnamaldehyde (an organic compound found in cinnamon) prevents clumping of blood platelets. 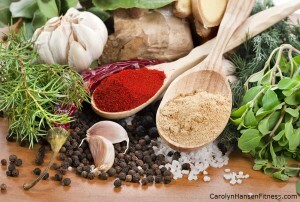 That and other compounds found in this spice are anti-inflammatory. You can actually improve brain function just by treating yourself to the aroma of this enticing spice while cooking. Cinnamon can be enjoyed in so many things from coffee and teas to casseroles and desserts. Parsley: You can’t get any more “everyday” than parsley. Rich in vitamin C, iron, calcium and potassium, this mild, leafy herb has been left on too many plates in restaurants around the world as simply a “garnish”. If people only realized how healthy it really is for us. Basil: Basil offers flavonoids that act as powerful antioxidants. Bright green and delicate, it’s high in vitamins A and K and offering potassium and manganese as well. Basil is easily grown at home in a garden or even on a windowsill. You can easily freeze or dry and excess. A favorite in sauces, salad dressings, pesto, sandwich spreads, as well as on meats such as chicken, beef, port and fish. Rosemary: Rosemary offers terpenes that slow down free radical development and stop inflammation. Terpenes also block some estrogens that cause breast cancer. Use it chopped to roast chicken, cook beef or lamb. Cloves: Rich in manganese and omega-3 fatty acids, these flower buds contain eugenol that helps reduce toxicity from pollutants and prevent joint inflammation. It offers kaempferol and rhamnetin, two flavonoids that act as antioxidants. A perfect addition to hot beverages like coffee and tea and can be used as successfully in dessert recipes and compotes. This is just a short list of some of the more commonly used spices. There are plenty more and all of them are worth experimenting. Healthy food is meant to be healthy…not boring! Keeping things simple is key and if you are failing to achieve your fitness goals that may be the issue. “Minimalist Fitness and Nutrition program can teach you the life-changing principles that will change your life and your body forever.